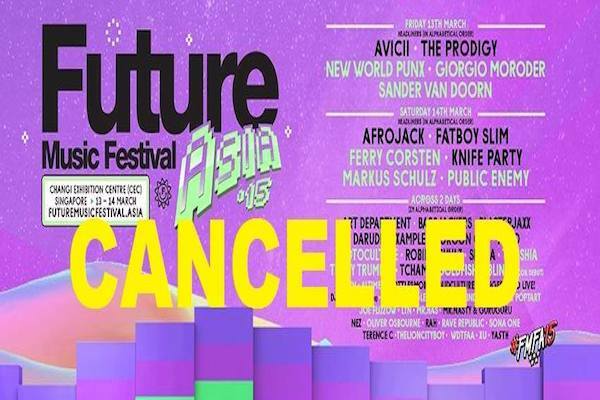 All Future Music Festival Asia 2015 ticket purchasers will have their tickets refunded. Reimbursement of refunds for FMFA 2015, which was scheduled to be held at the Changi Exhibition Centre in Singapore on 13 & 14 March 2015, will begin in batches tomorrow (Tuesday, 10 March 2015). The refund process is expected to take between 30 – 45 days to complete. · For all SISTIC and Galactix ticket buyers who have purchased tickets via a credit or debit card, refunds will be credited directly into your respective accounts. This includes refunds for car park passes purchased. Reimbursements of your refund are expected to take at maximum 30 – 45 days. (If the tickets were purchased using a local Singaporean credit or debit card, you can expect to receive refunds within 7 – 14 days). · Refunds for SISTIC tickets purchased via cash or eNETS will also be refunded within a one-month period. Collection of refunds can be made at the SISTIC Headquarters (10 Eunos Road 8, #03-04, Singapore Post Centre, Singapore 408600). A subsequent official announcement will be made when refunds are ready to be collected. · For those who have preloaded credits onto your wristband, refunds will also be credited directly back into your credit or debit card account within 30 – 45 days. · Ticket refunds will also be made payable to all ticket buyers who have purchased packages via an FMFA authorized travel agent. We have instructed the travel agents to refund you directly within 30 – 45 days. We thank all fans for their patience and support. Our care team is at hand to provide any further clarification or assistance and can be reached at support@futuremusicfestival.asia.